At 57:46 a Samoan 35 year-old female called Kathryn talks to Danny Watson about the word 'poverty'. What it means to her living in Mangere Central; what it means to her mates and why the rest of us should stop using it. Have a listen. You won't regret it. Where once it was a mark of pride to take care of oneself in difficult situations, there is now an expectation that the government should save us, salve us, and secure us in all areas of our lives. For example, travelers and expats are increasingly expecting the government to rescue them from volatile foreign hotspots. A further example of our coddled citizenry comes from a couple who, according to Richardson, queried whether they could claim frequent flyer points from a government-arranged emergency flight out of Egypt during the recent upheavals – where the taxpayer was footing the bill. Government is a mechanism to ensure a degree of order, national security, and representation in our lives. It is not a substitute parent whose role is to fund, soothe and cater to the demands of overindulged and heedless children, although with pandering to the polls and policy-on-the-run, you could be forgiven for thinking otherwise. A recent commercial on television showed a fit, young man offering his dole cheque to win tickets to a rugby competition. What was most striking about this ad – its tongue-in-cheek nature notwithstanding – was the assumption that it’s normal for a healthy and able-bodied man to be on welfare. Such attitudes are becoming commonplace in today’s dysfunctional welfare society, but this is certainly not desirable. Welfare statism effectively reduces elements of its citizenry to an enfeebled and dependent state, unable or unwilling to take responsibility for their own lives, actions and decisions. And it infuses the culture with a widespread belief that it’s up to the government to fix and manage just about everything, including help in claiming air miles. The final word goes to acting Foreign Minister, Craig Emerson, who said recently: ‘There are limits to what the Australian government can do in a consular crisis.’ There are indeed limits to what the Australian government, or any government for that matter, can do – and should do – in our lives. Period. Meegan Cornforth is Events Manager at the Centre for Independent Studies. Every Child Counts, the left-wing conglomerate - blame-everybody-but-the-parents-for-child-poverty group - commissioned a report from Infometrics (yes, Gareth Morgan's outfit - now also part of the poverty industry). It was released mid-August but gained no traction. 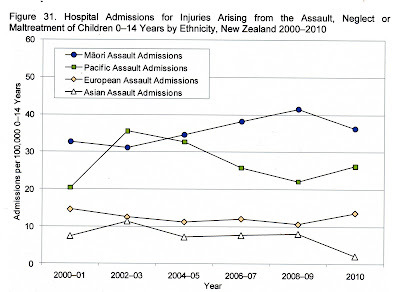 Initially I thought, on reading a piece in the NZ Herald this morning titled, Brown poverty a 'time bomb', they are having a second push by bringing race into it. Guaranteed to spark. But then the Herald says the report is released "this morning". Not short of a bob or two are they? Ironically the 'poverty' industry appears quite rich. Anyway, one of the Every Child Counts advocates, Hone Kaa, is lining up behind the coroner who wants all children monitored. But isn't the problem 'brown', to use his word? "I really don't care for adults who say 'that's prying too much into my personal business'. As far as I'm concerned I want to save a child," Dr Kaa said. The report argues that new ways of measuring well-being need to be developed which take into account Polynesian world views. The liberal concepts of Maori. Polynesian world views. They worked in past context perhaps. 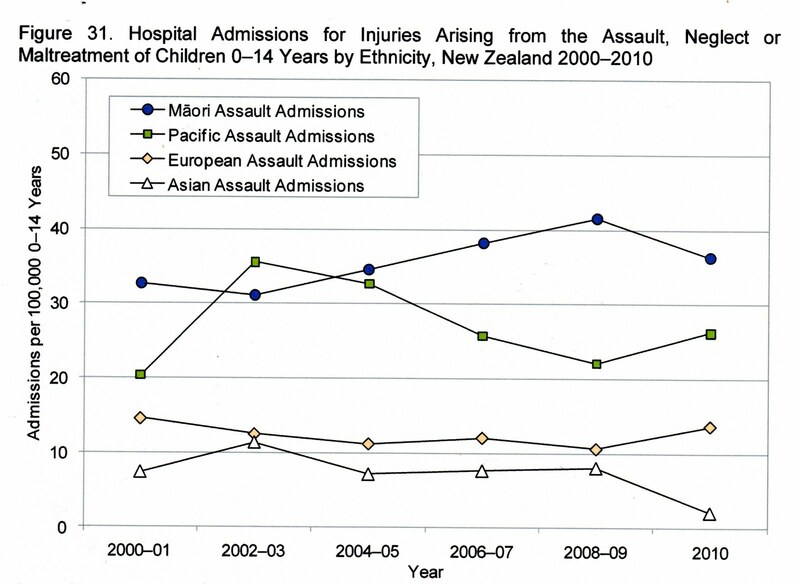 Within a large whanau or hapu. Children being raised by elders. 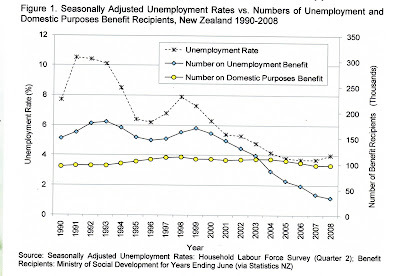 But they don't work within the modern NZ welfare state. Still the problem is misdiagnosed. Kiwiblog has a post about Labour's old 'new' youth unemployment policy. It details the recycling of the old policy at least four times. But why stop at 2000? 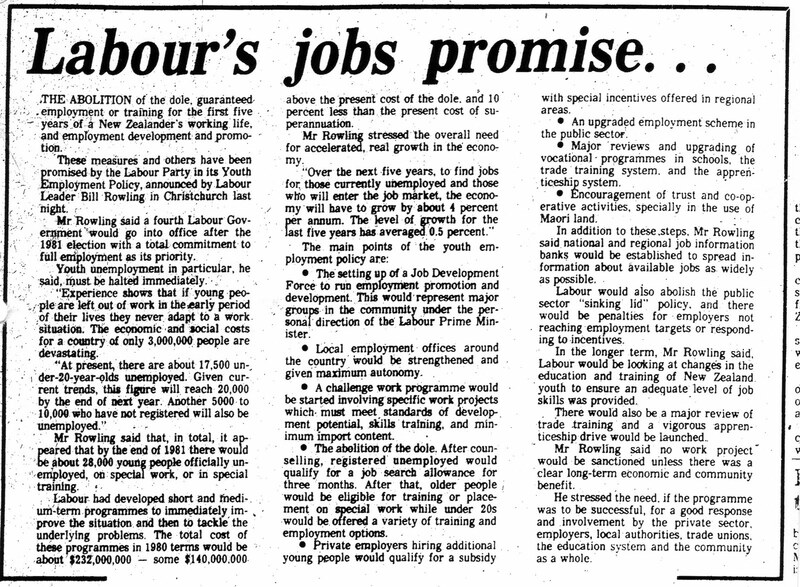 Below is their 1980 policy as it appeared in the Evening Post, Thursday October 30, 1980. 2011 - Labour today announced its youth skills and employment package which gives all teenagers the opportunity to be earning or learning within three years. 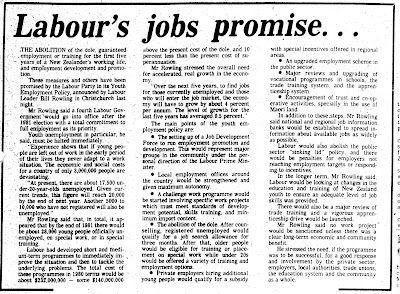 1980 - Mr Rowling said a fourth Labour Government would go into office after the 1981 election with a total commitment to full employment as its priority. 2011 - “This is a ticking time-bomb and has to be fixed. These kids are our future but at the moment they are being left on the scrapheap. If we don’t do something now, we will all pay a far higher price. 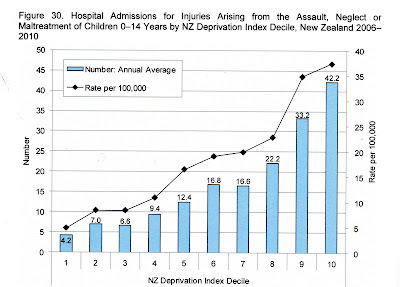 The New Zealand Institute estimates the cost of disengaged youth is $900 million a year. 1980 - "Experience shows that if young people are left out of work in the early period of their lives they never adapt to the work situation. The economic and social costs for a country of 3,000,000 people are devastating." Somehow I don't think today's announcements are a game changer for Labour. They weren't in 1980 either. 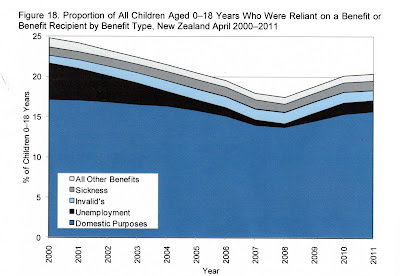 Gareth Morgan's answer to the burgeoning welfare system, the Universal Basic Income (UBI) of $11,000 per year for every adult, leaves three acknowledged cohorts worse off - superannuitants, sole parents and the asset rich - probably a third of the adult population. Gareth addressed those but ignored a fourth group - 144,000 sickness and invalid beneficiaries many of whom are receiving more than $211.50 per week. Over half receive an accommodation supplement and many receive disability allowances. The targeted assistance Morgan wants to dispense with helps these people to a much greater extent than the UBI would. Treasury modelled a Guaranteed Minimum Income for the Welfare Working Group (at the group's request after Gareth and Sue Bradford both proposed some form of universal basic income at its initial conference). It pointed out that some of the neediest welfare recipients would be worse off even at a level of $15,600 per annum. As well Treasury noted the negative effect these schemes would have on productivity, savings and investment, none of which can be over-emphasised in my opinion. Similar experiments have been tried before, notably negative income tax in the US, and did not have beneficial outcomes. Which is hardly surprising. Paying all adults - Treasury modelled from 16 years up - with or without productive return, is surely more of what has unhinged the present system which provides a viable alternative to work but indulges family breakdown and self-destructive behaviour. Morgan is extolling more of the state-legislated wealth redistribution which has us in the mess he now wants to 'fix'. Surely the point is that individuals used to rely far more heavily on each other. They formed stable and committed families that provided for raising children, caring for the elderly, and supporting each other in times of adversity. Incidentally, very much the Asian way of providing welfare. For three decades after the 1938 social security net was created people relied on it sparingly and treated the system and, by inference, each other with respect. That was the overriding value that has weakened and needs to be restored. People are born to make their way in life through endeavour and forming positive partnerships. Not to wait till they reach 16 and have the state chuck a couple of hundred bucks their way unconditionally for the duration. Morgan fails to acknowledge the enormous personal disincentive effect such a practice would incur. For instance, drug and alcohol abuse are increasing problems in society. Young people could pool resources and lead lives that require none of the discipline associated with working for a living. All of the social fall-out and intergenerational dysfunction would continue. Rather than re-invent 'welfarism' - broadly speaking, any subsidy from the state - New Zealand needs to reduce it. That begins with the clear, unequivocal message that welfare is a strictly temporary hand-up for any person capable of working and supporting themselves. As well, the eligibility age for Super must be lifted to match lengthening life expectancies. That will enable lower taxation - not greater as required by the UBI - and will bring investment, entrepreneurship and jobs to a country that is now blessed with its geographic position in relation to the rapidly economically transforming world. It was my prediction that the ACT party's polling would climb under Don Brashs' leadership. I was wrong. But I am so often in a such a small minority intellectually it is no wonder I cannot understand how other people think. However, I made my prediction before knowing John Banks was going to stand in Epsom. That now makes my vote highly marginal and perhaps other past ACT voters are feeling the same. Catherine Isaac might neutralise the 'Banks effect' for me but the problem remains - that ACT has no clear political philosophy. Apparently it is now the farmer's party. It also looks very euro centric at times. What is ACT 2? If there are members in there still holding out to give the party a clear classical liberal direction I admire their tenacity. 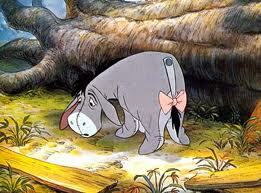 Perhaps past voters are just fed up with the in-party shannanegins, for want of a better word. Ongoing instability does not engender confidence. Or trust. Perhaps polling will improve markedly on the day that counts. But because that has happened in the past is no guarantee it'll happen again. And do I even care? You will have read or heard about the updated Children's Social Health Monitor released today. It examines the effect of the recession on things like unemployment, benefit dependence, deprivation, ill-health and hospital admissions. 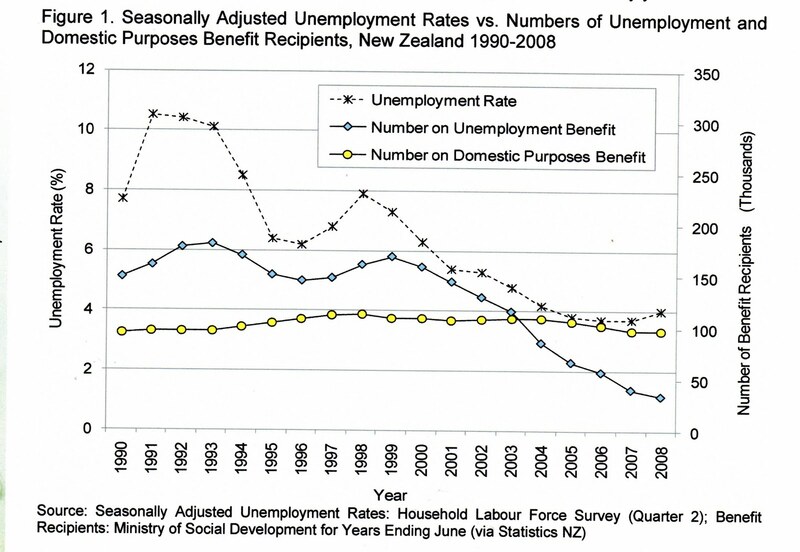 But the following graphs highlight that dependence on the DPB isn't enormously effected by the unemployment rate. 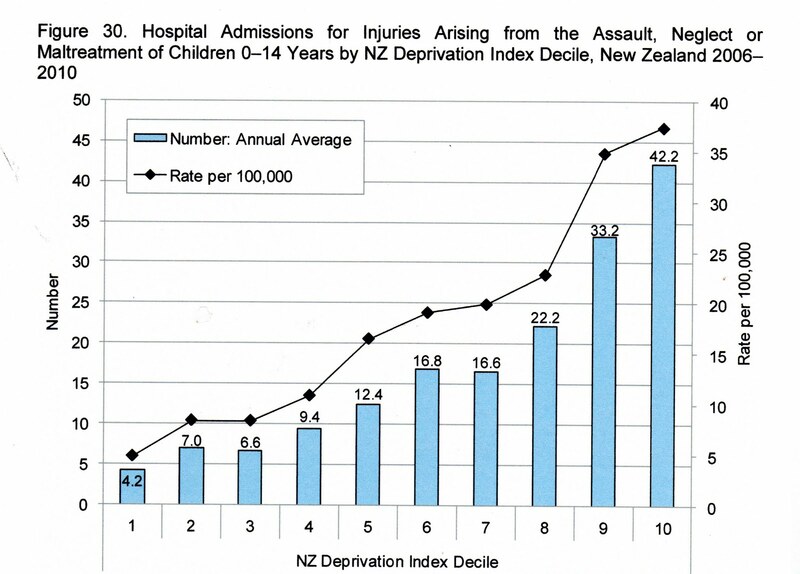 With or without a recession, far too many children rely on the DPB and subsequently are 'poor'. Following that is the ethnic breakdown. How many times have you heard PC, self-deceiving types saying that abuse happens across all of society? I suppose technically that is true but it is intended to detract attention from where most of it happens. This year I have been giving pastel lessons which involve the student bringing a subject they want to capture. I provide the materials and we begin with the student following the steps I would take if the subject was a commission. At some point I abandon my demonstration piece and devote my full attention to their work. One talented lady turned up with a Meerkat (photo of at least) and was thrilled with her final painting. Last week, with nothing else to work on I got out the sketch I had begun and finished it off.